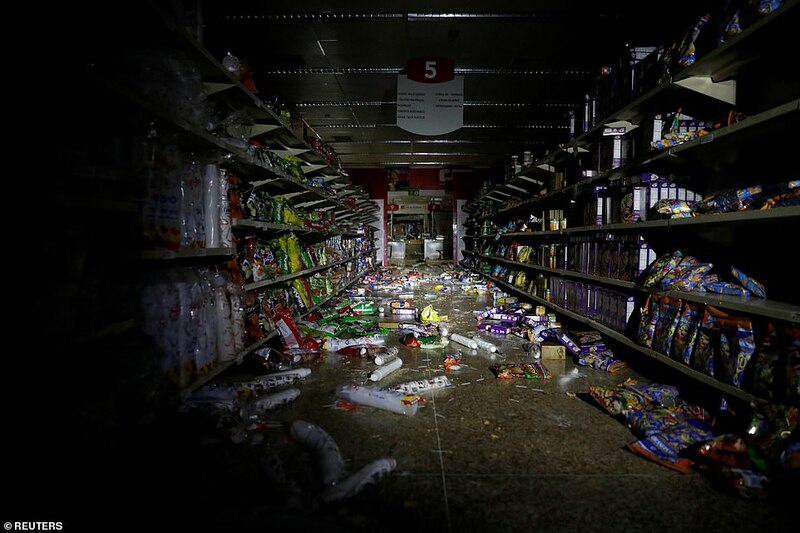 Some Venezuelans have taken to looting supermarkets in Caracas during the fourth day of blackouts, which have paralysed the country. 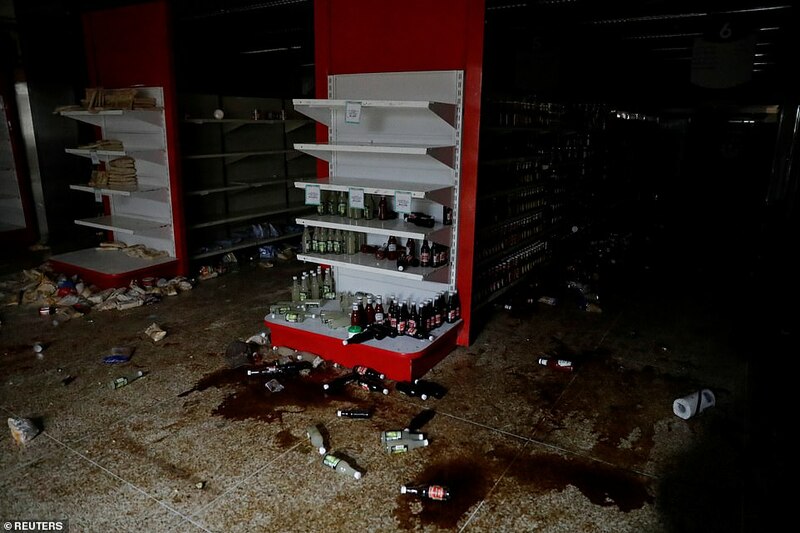 Pictures reveal that some supermarkets in the capital have been left ransacked by desperate residents as they struggle to find food. 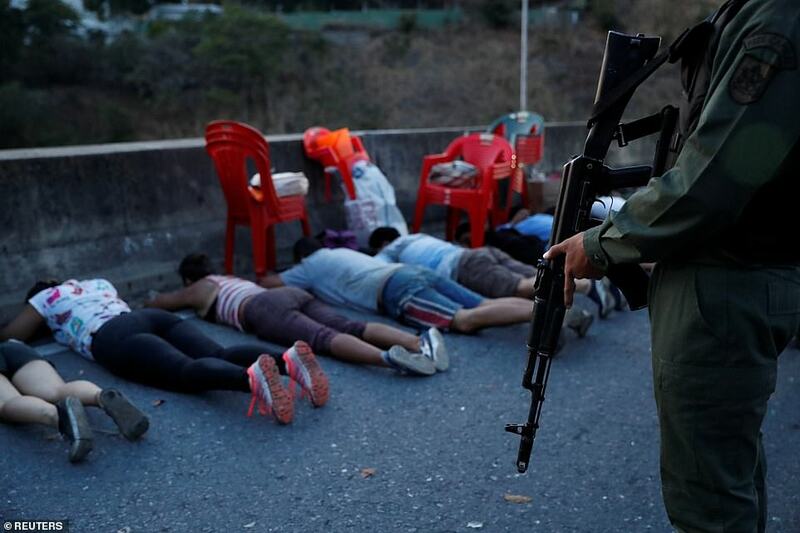 Security forces detained a number of people who were caught looting on Sunday, with some pictures showing looters being piled onto waiting trucks. 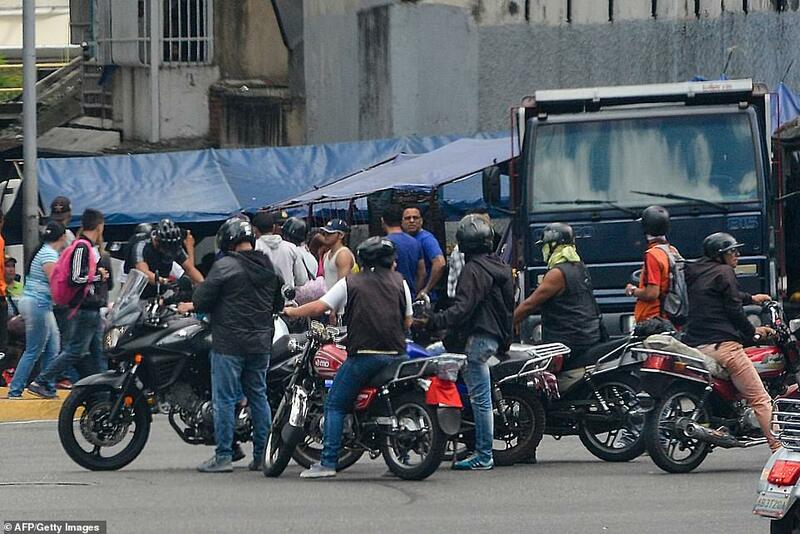 Armed men were seen forcefully escorting young men and women to the trucks. 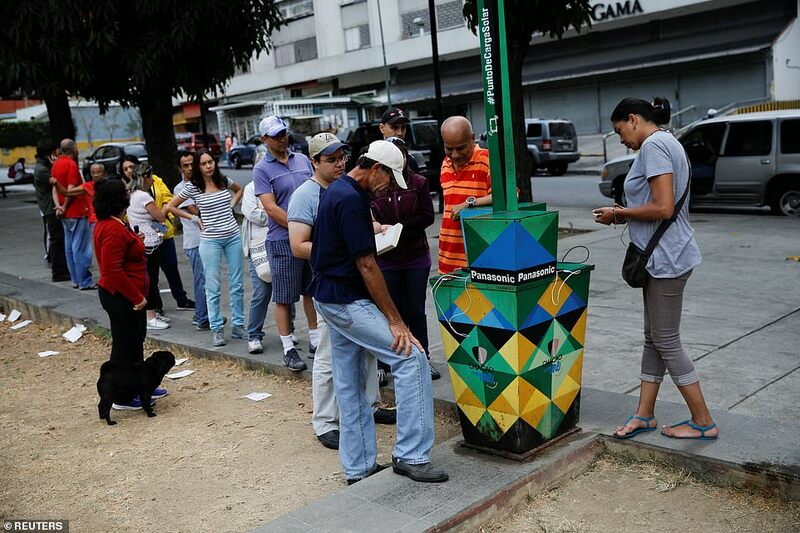 The country will enter its fifth consecutive day of power outages on Monday, which have also forced people to rummage through bins for food, queue to charge electronic devices using a solar panel and buy bread with 100-dollar bills after the country was hit by a fourth day of blackouts. 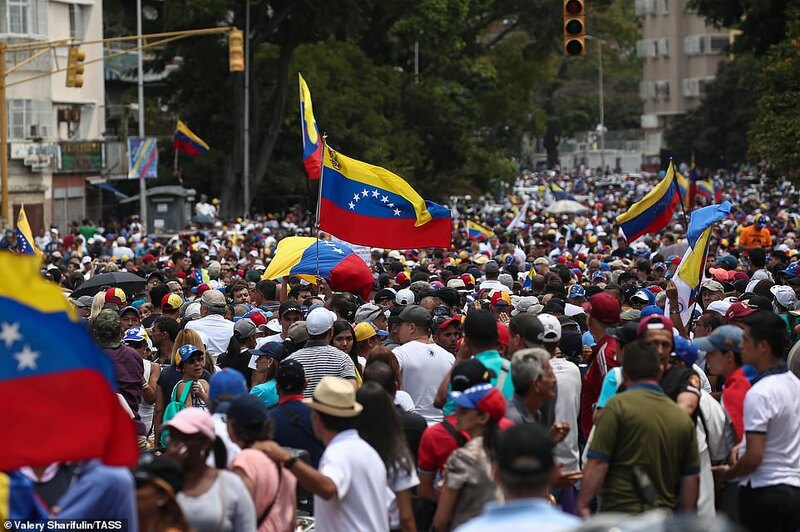 Opposition leader Juan Guaido called for a nation-wide march on Caracas to crank up the pressure on embattled President Nicolas Maduro, as the country endured its third night largely without power. 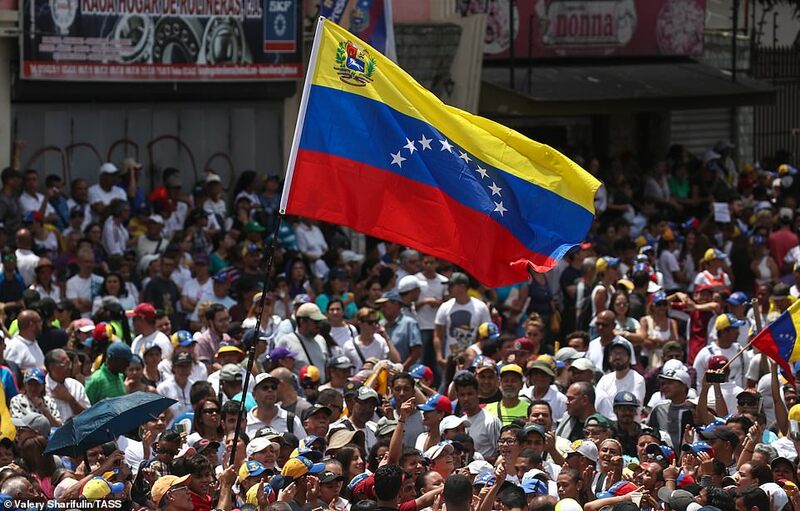 The massive blackout, crippling the oil-rich but economically troubled South American nation, has fuelled the political standoff between Guaido, who is recognised as Venezuela’s leader by more than 50 countries, and Maduro, who is clinging to power. 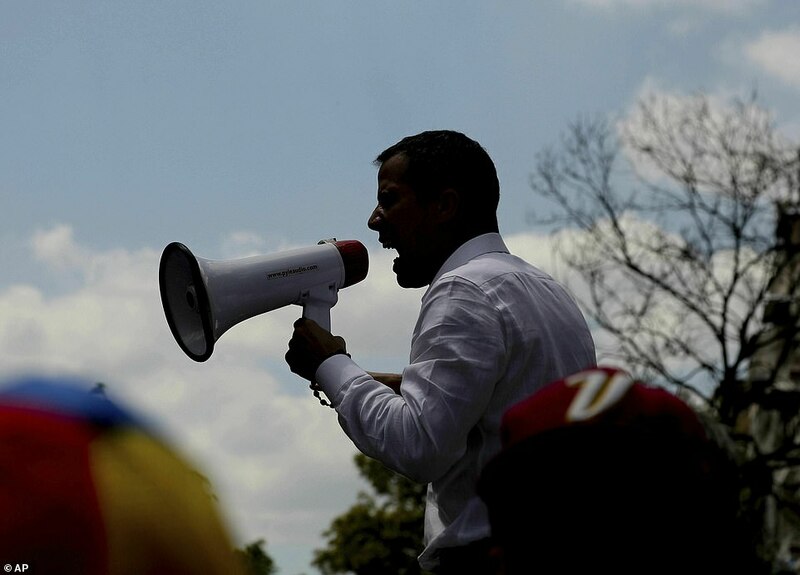 The 35-year-old Guaido, the head of Venezuela’s National Assembly, earlier told thousands of supporters that he would soon embark on a nation-wide listening tour before leading a march on the capital. 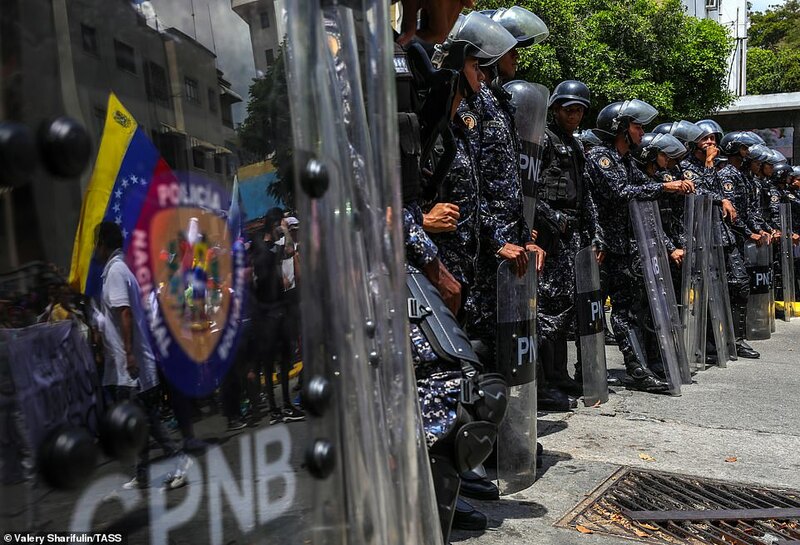 Guaido, who declared himself acting president in January, said he has convened an emergency session of the National Assembly on Monday ‘to take immediate actions with respect to the necessary humanitarian aid’. 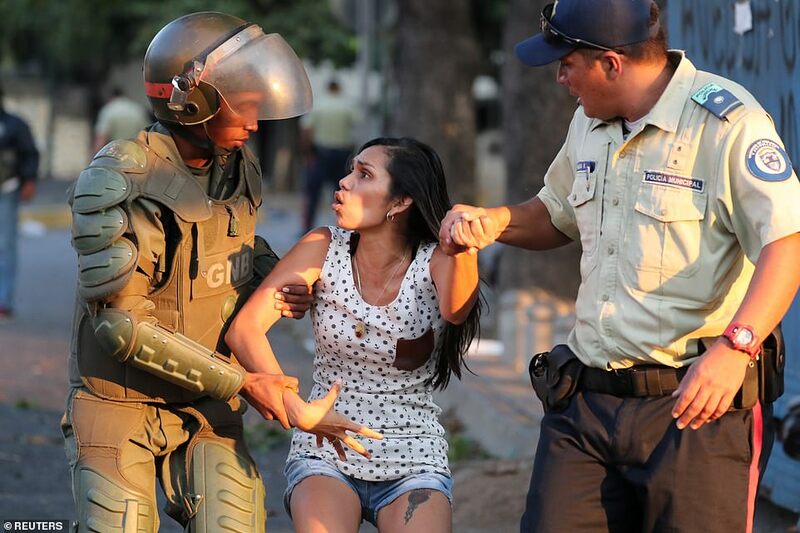 ‘We must attend to this catastrophe immediately. 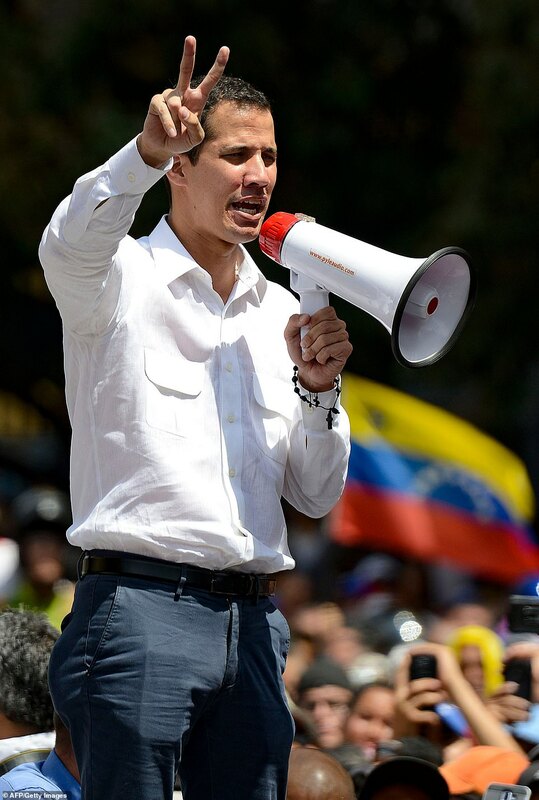 We cannot turn away from it,’ said Guaido. 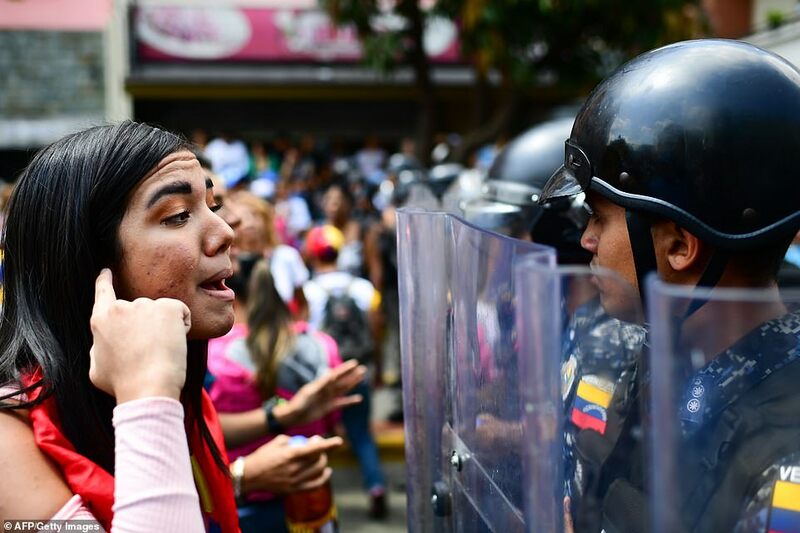 President Nicolas Maduro has so far rejected international aid, using his security forces to repel an opposition bid last month to bring in aid through neighbouring countries Colombia and Brazil. 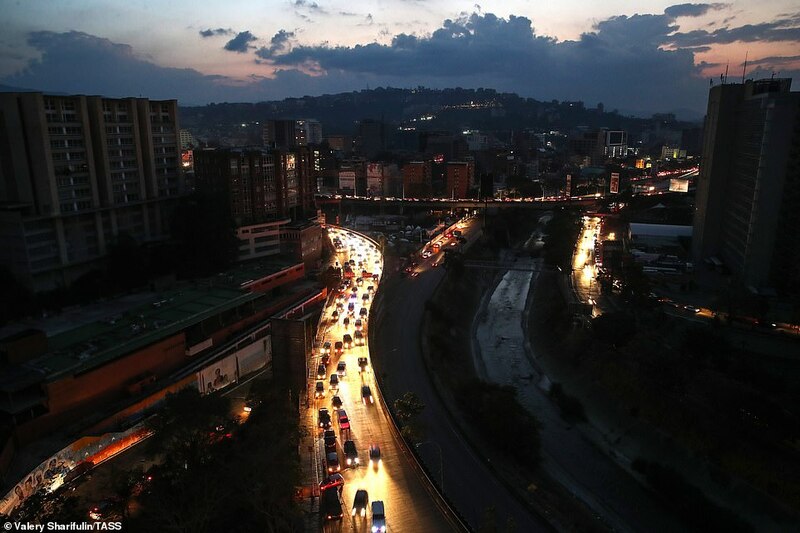 Maduro has claimed that the power outage at the country’s Guri hydroelectric complex, the source of 80 percent of the country’s power, was caused by a cyberattack. 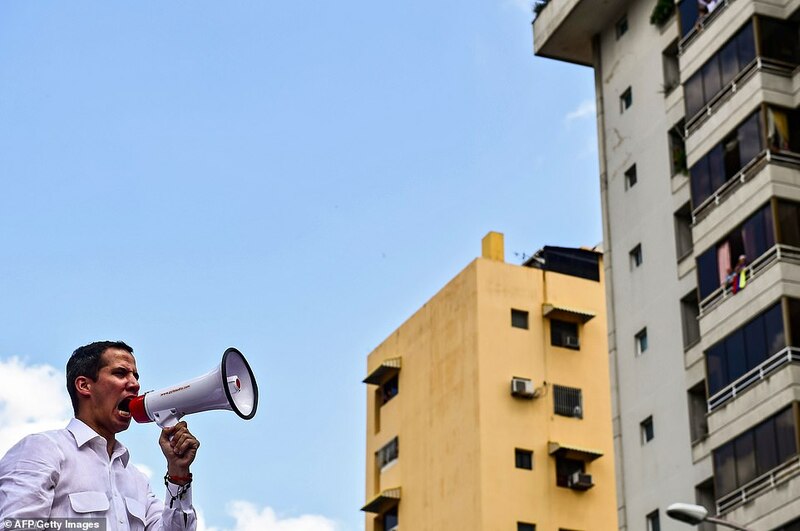 Addressing supporters in southwestern Caracas, Guaido – the leader of the opposition-run congress who invoked the constitution to assume an interim presidency in January – said Maduro’s government ‘has no way to solve the electricity crisis that they themselves created’. 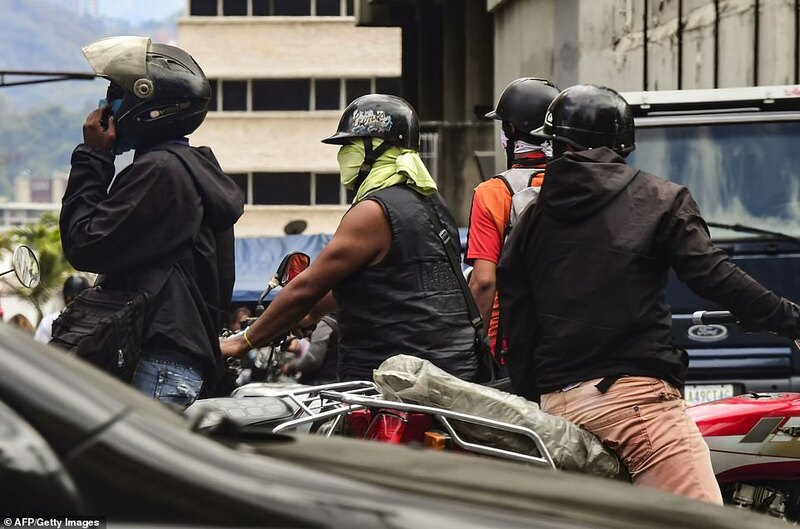 ‘Once we’ve finished the tour, the organisation in every state, we’ll announce the date when all together, we’ll come to Caracas,’ Guaido said, a megaphone in his hand as he stood on the roof of a pickup truck. 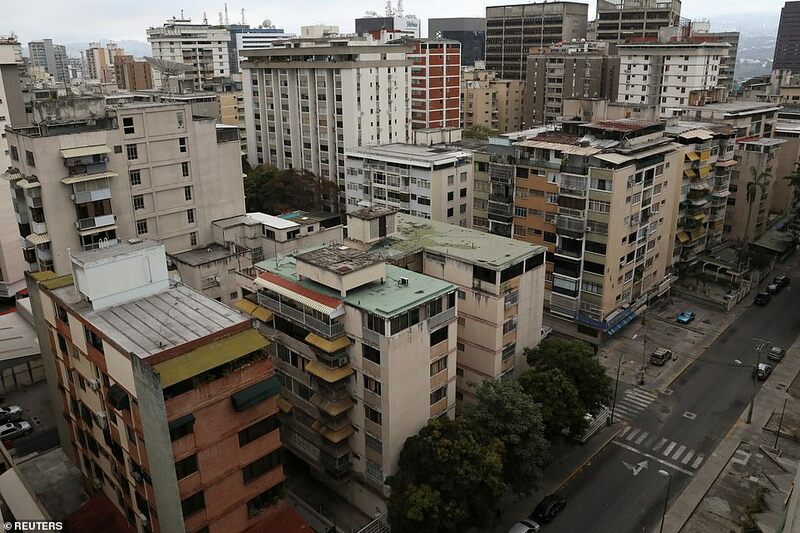 The power flickered on and off in parts of Caracas on Saturday morning, including the presidential palace of Miraflores. 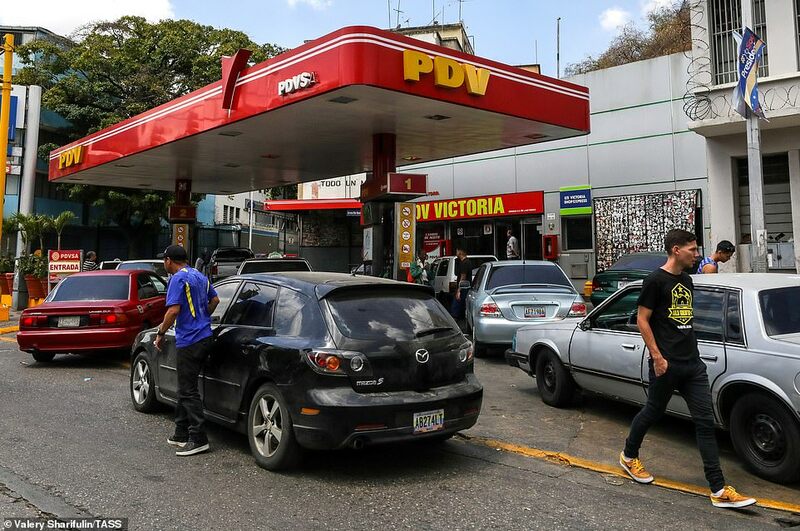 Six of the country’s 23 states still lacked power as of Saturday afternoon, Socialist Party Vice President Diosdado Cabello said on state television. 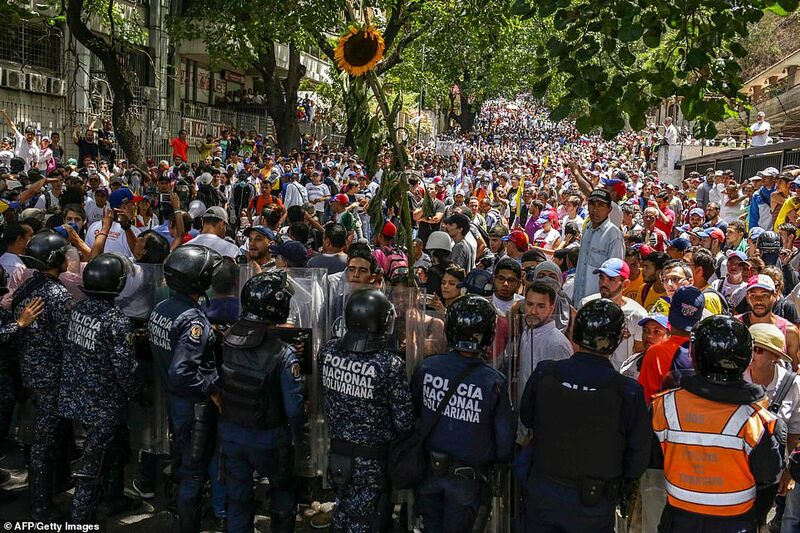 ‘Miraflores, Miraflores!’ chanted Guaido’s supporters in response – a reference to the presidential palace currently occupied by Maduro. 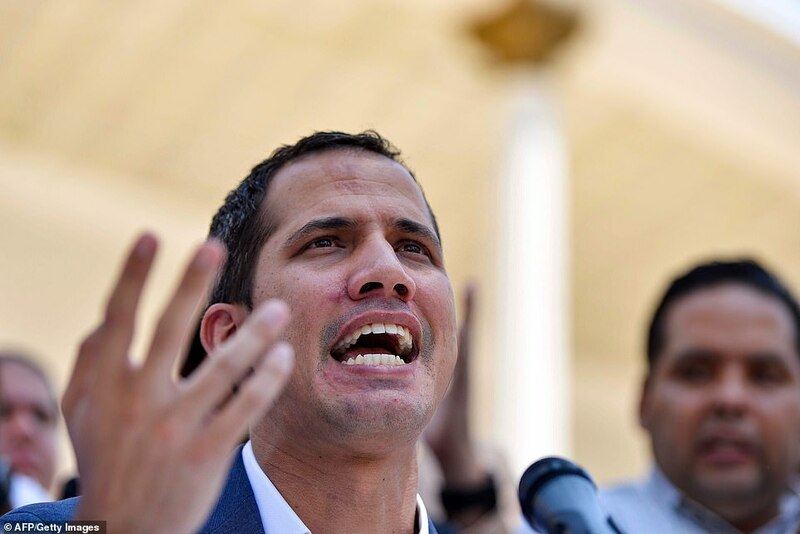 Guaido, who proclaimed himself president of the country of 30 million people in January and says Maduro’s May re-election was illegitimate – wants to set up new polls. 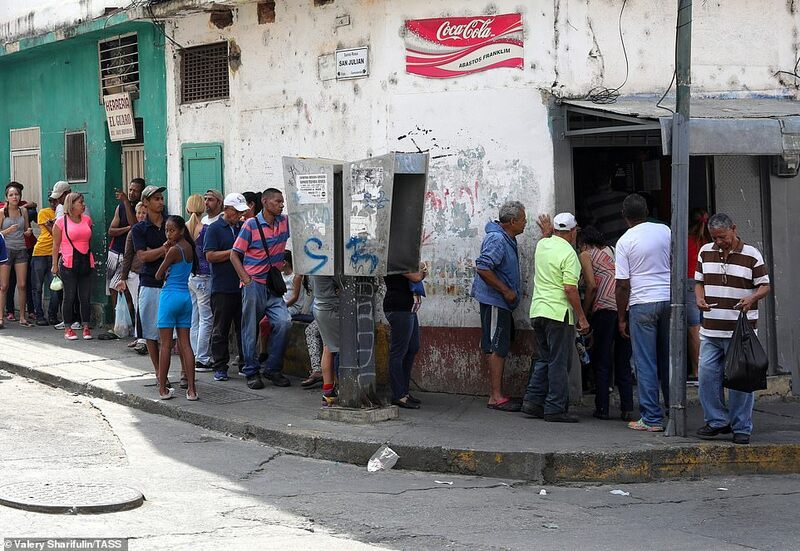 ‘All the options are on the table,’ he said, borrowing a phrase from US President Donald Trump. 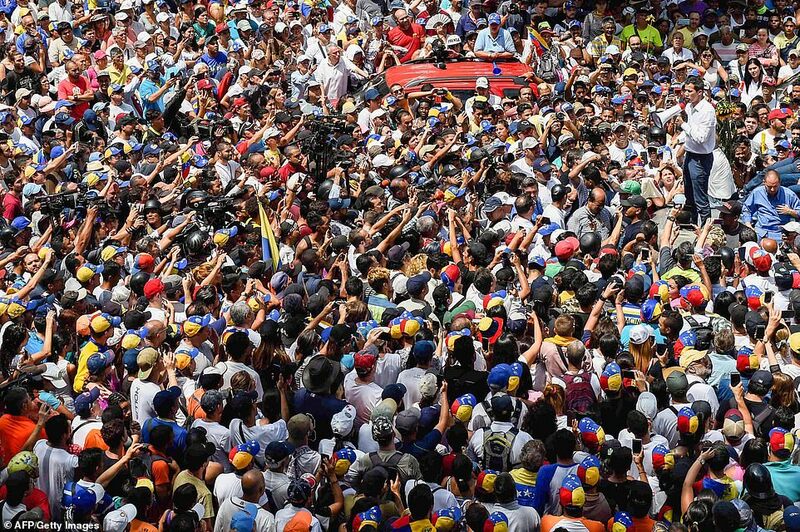 Maduro also rallied his supporters. 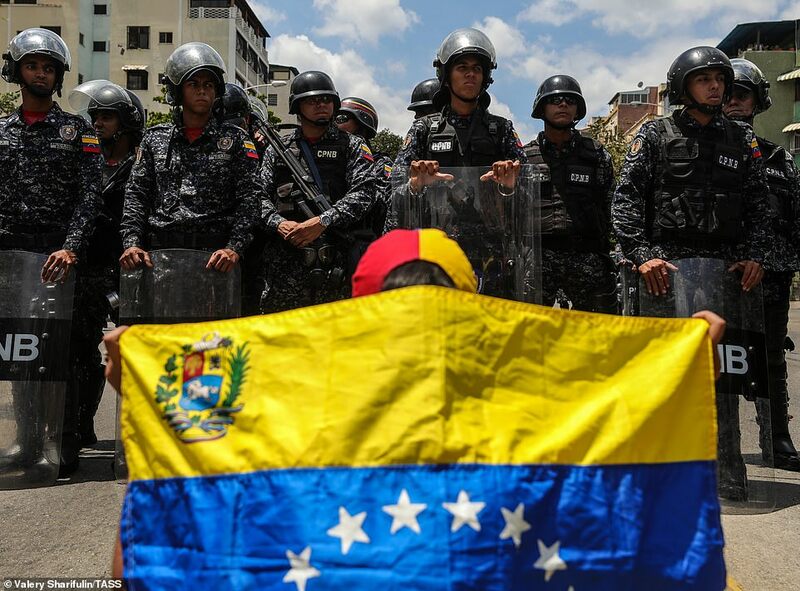 Wearing red, they protested against ‘imperialism’ at a march that marked four years since the United States branded Venezuela a ‘threat’ to its security and imposed sanctions. 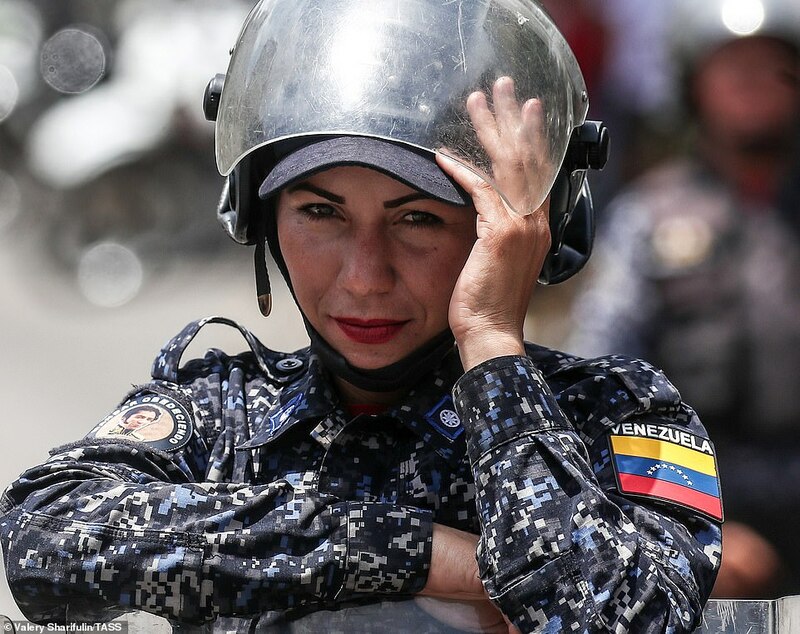 ‘Today, more than ever, we’re anti-imperialists. 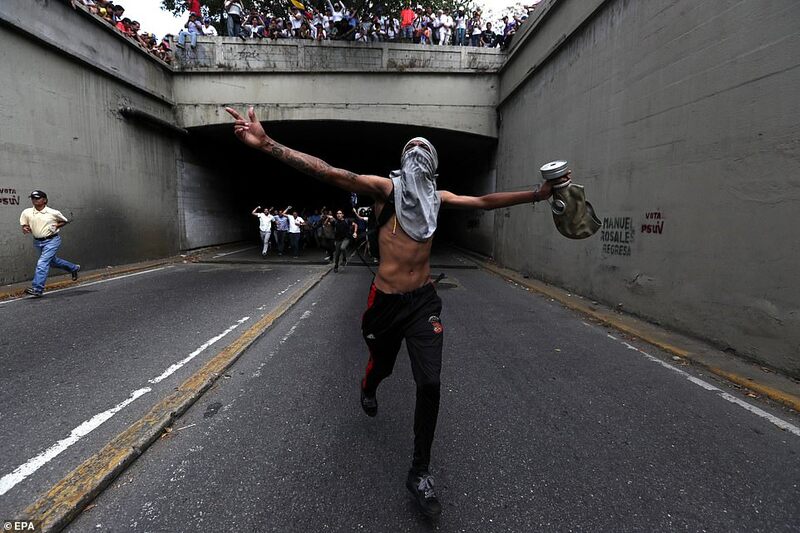 We will never surrender!’ Maduro wrote on Twitter. 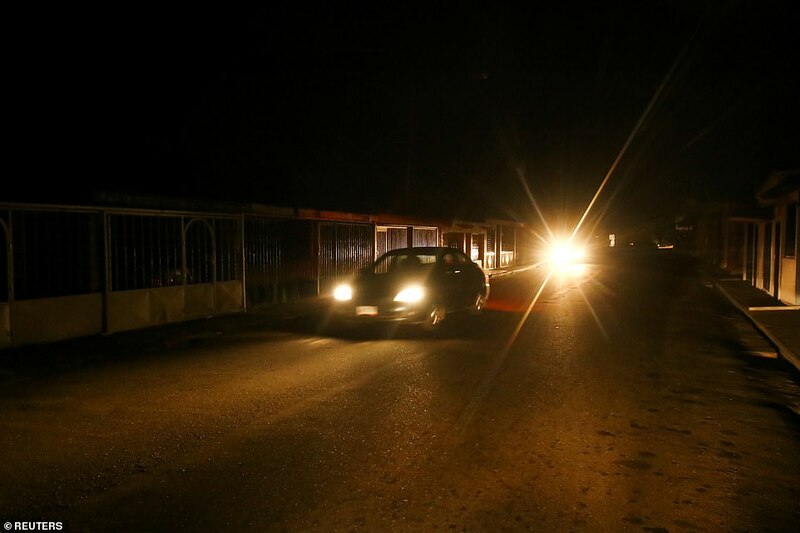 He said almost 70 percent of power had been restored by mid-day, when a ‘cyber attack’ was reported at a major power plant. 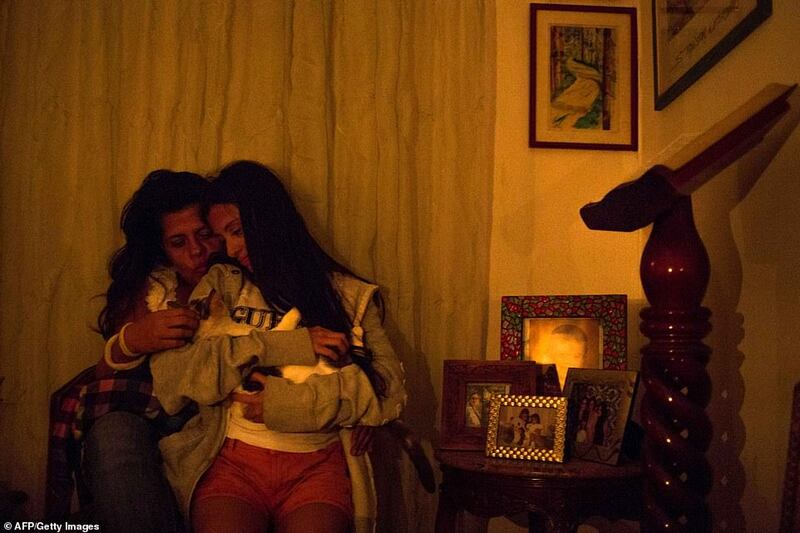 ‘That disturbed and undid everything we had achieved,’ he said. 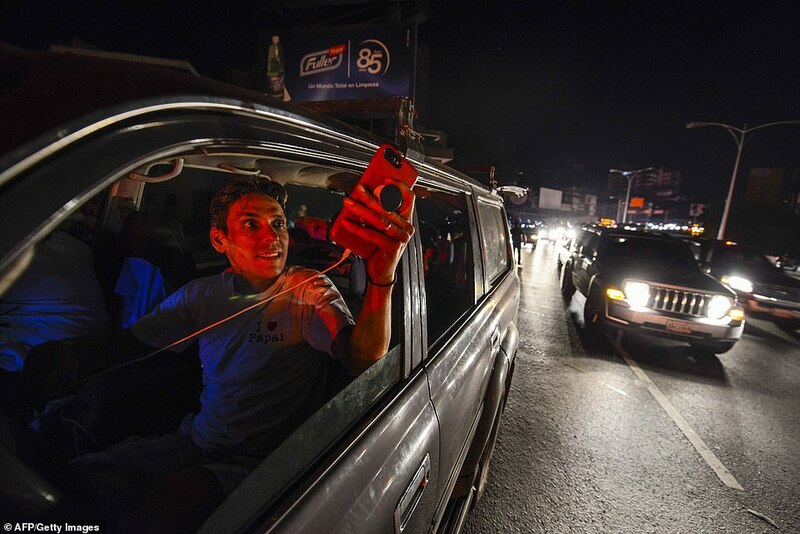 But the deaths could not independently confirmed or even whether they could have resulted from the blackout. The Information Ministry did not respond to a request for comment. 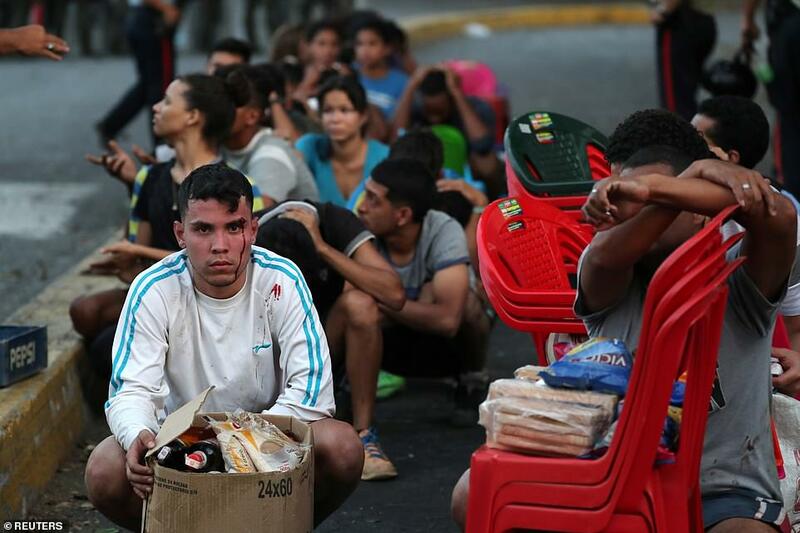 ‘We’re not offering services and we don’t have any patients staying here because the generator is not working,’ said Chiquinquira Caldera, head of administration at the San Lucas clinic in the city of Maracaibo, as she played a game of Chinese checkers with doctors who were waiting for power to return. 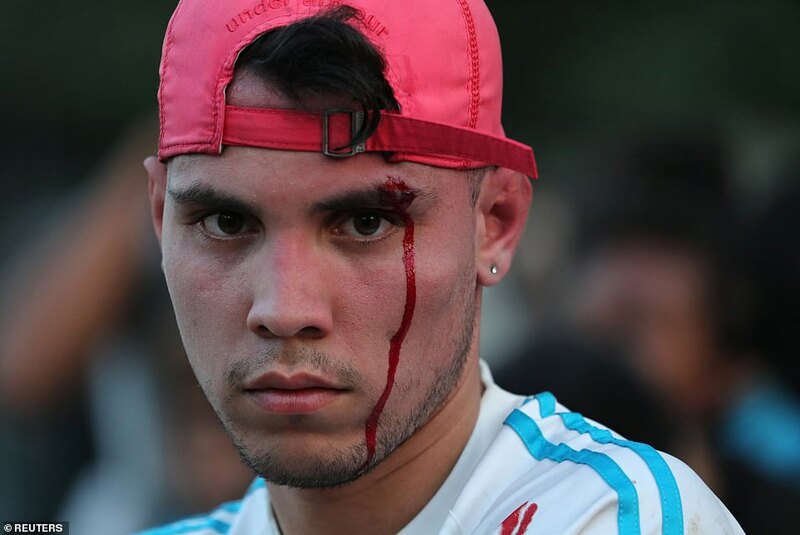 ‘The right wing, together with the empire, has stabbed the electricity system, and we are trying to cure it soon,’ he said. 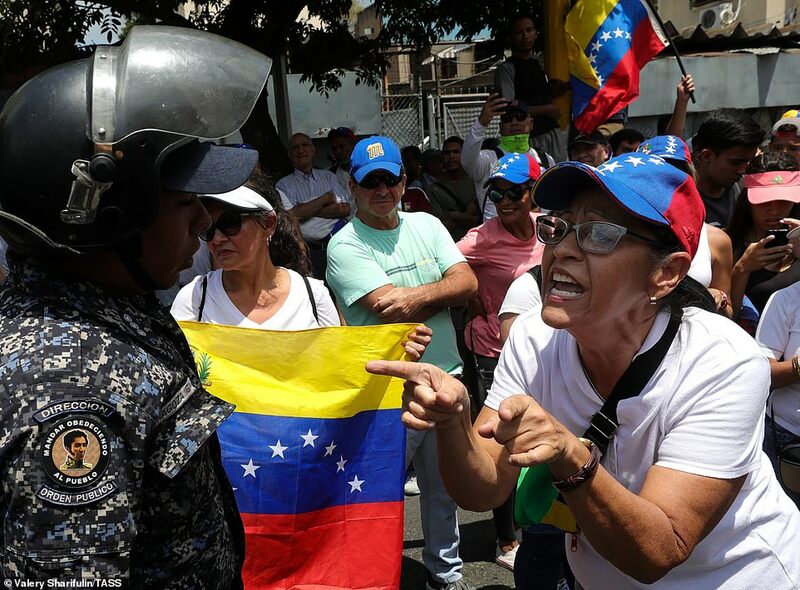 ‘We’re here, we’re mobilised, because we’re not going to let the gringos take over,’ said Elbadina Gomez, 76, who works for an activist group linked to the Socialist Party. 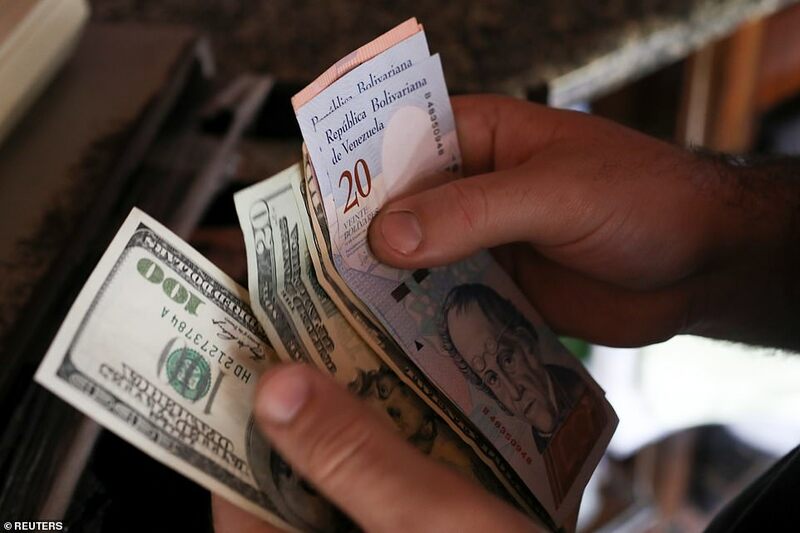 Problems have been exacerbated by hyperinflation that the International Monetary Fund says will reach 10 million percent this year. 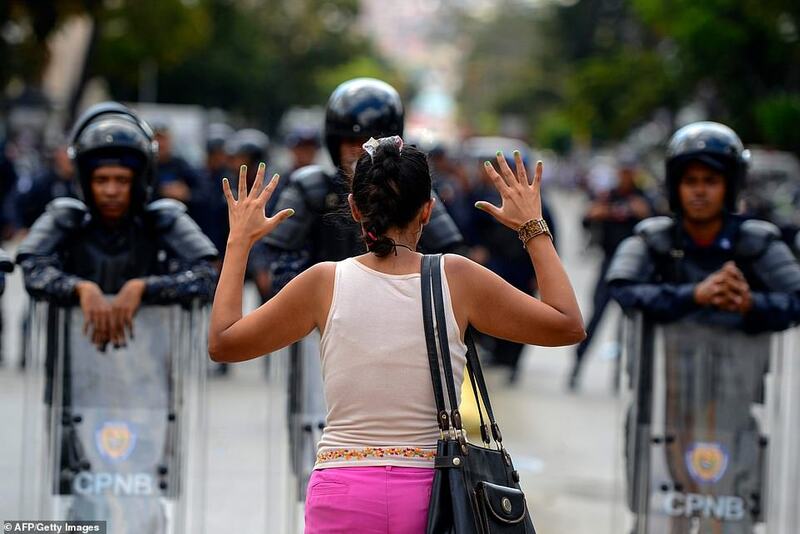 ‘I’ve spent three nights in a lot of distress. 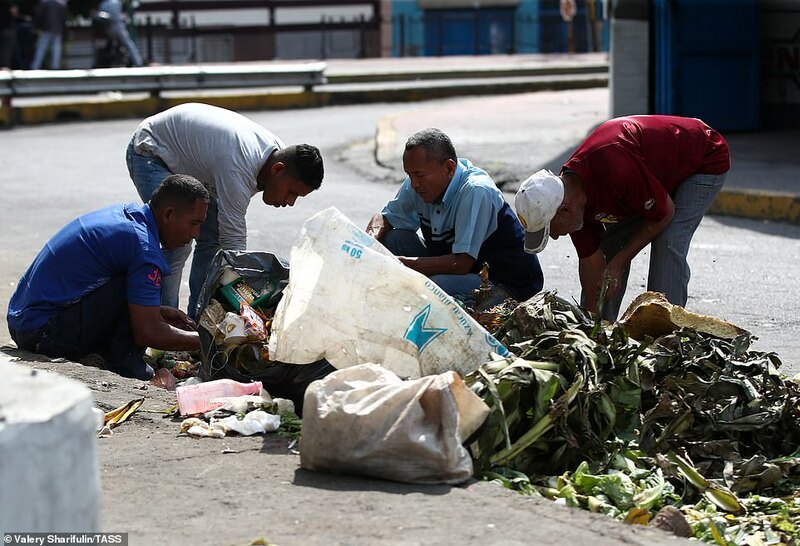 I’m very anxious because the situation is not getting resolved, the little food that we have in the fridge is going to spoil,’ said Francisca Rojas, a 62-year-old retiree living in Caracas. 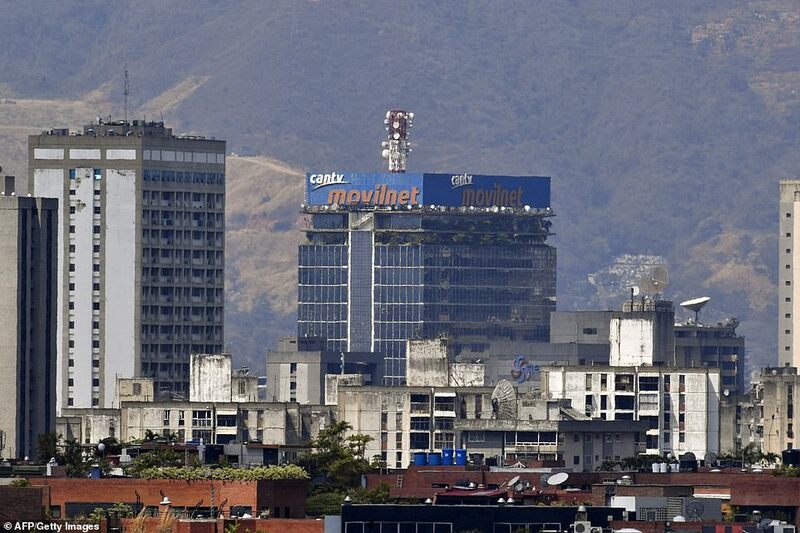 Communications Minister Jorge Rodriguez blamed the initial power outage on a cyber attack against the Guri hydroelectric plant in the country’s south, which serves 80 percent of Venezuela. 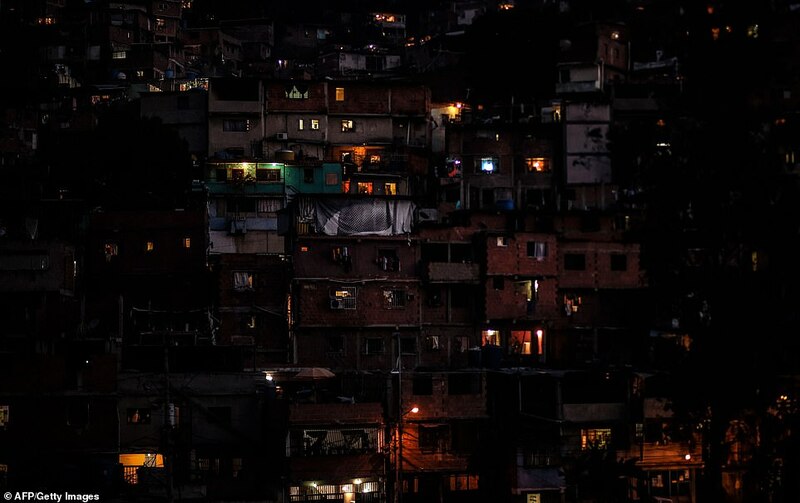 Critics blame the government for failing to invest in maintaining the power grid. 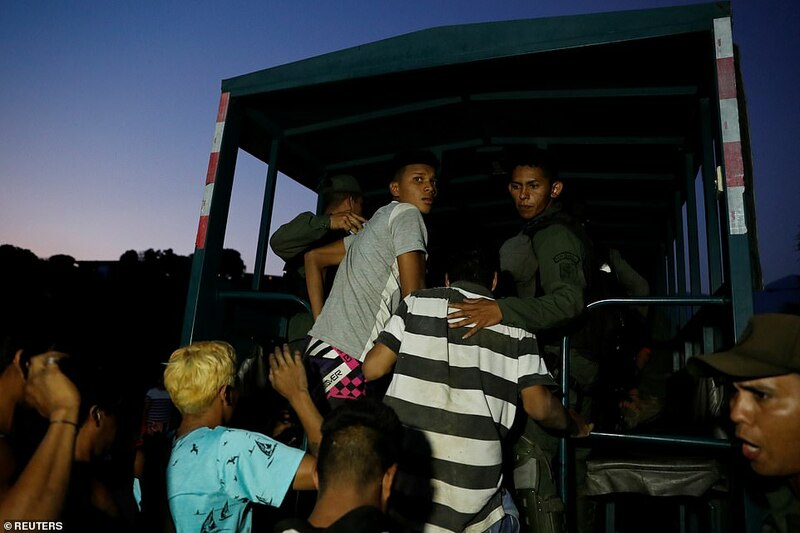 Hospitals have since reported terrible problems, and those with generators were using them only in emergencies, while flights were cancelled, leaving hundreds of travelers stranded at airports. 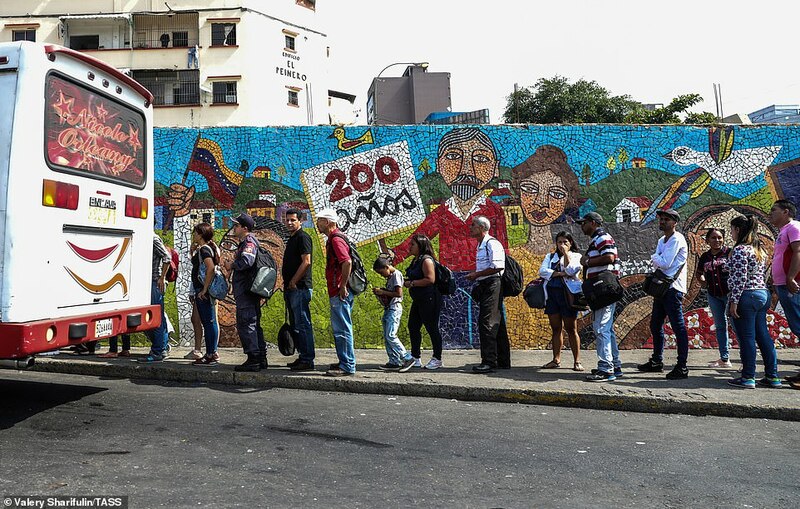 The Caracas subway, which transports two million people a day, remained shuttered. 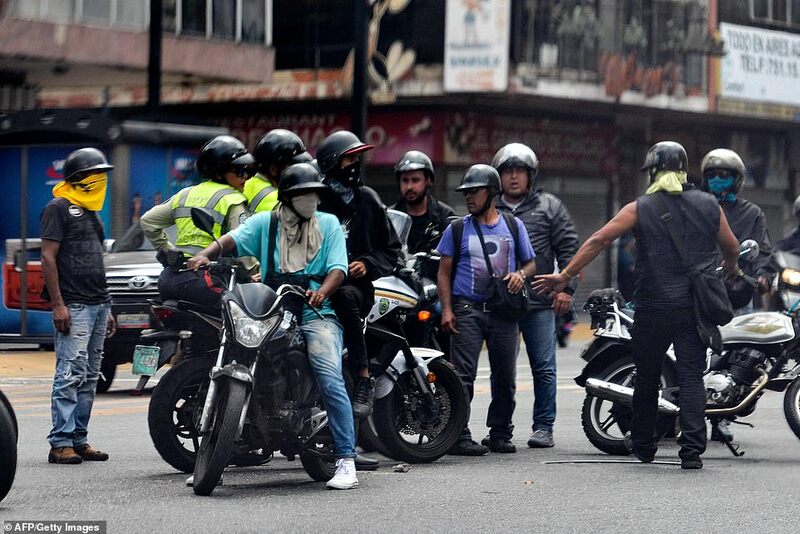 Francisco Valencia, director of the Codevida health rights group that reported the 15 deaths, said some 10,200 people were at risk because dialysis units had switched off. ‘We are talking about 95 percent of dialysis units, which today likely hit 100 percent, being paralysed, due to the power outage,’ he said. 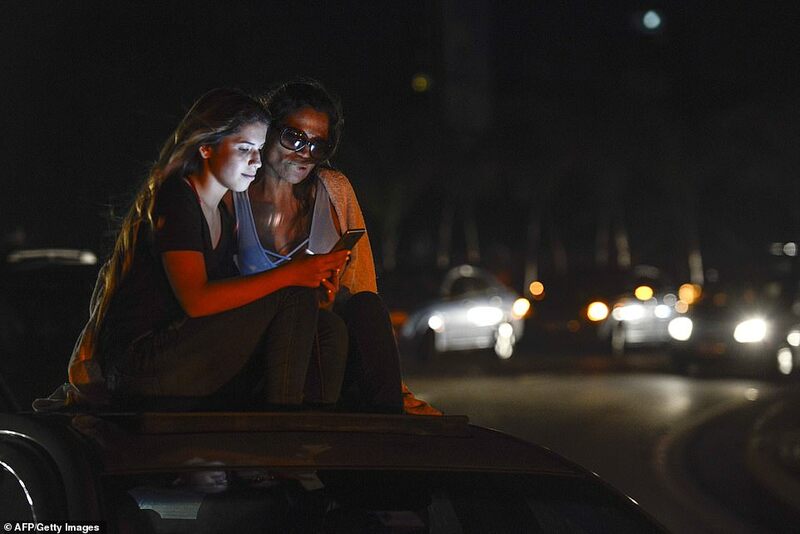 Late Saturday, entire families parked their cars along the main highway in Caracas in the hopes of capturing faint cell phone service to check on loved ones and get the latest news. 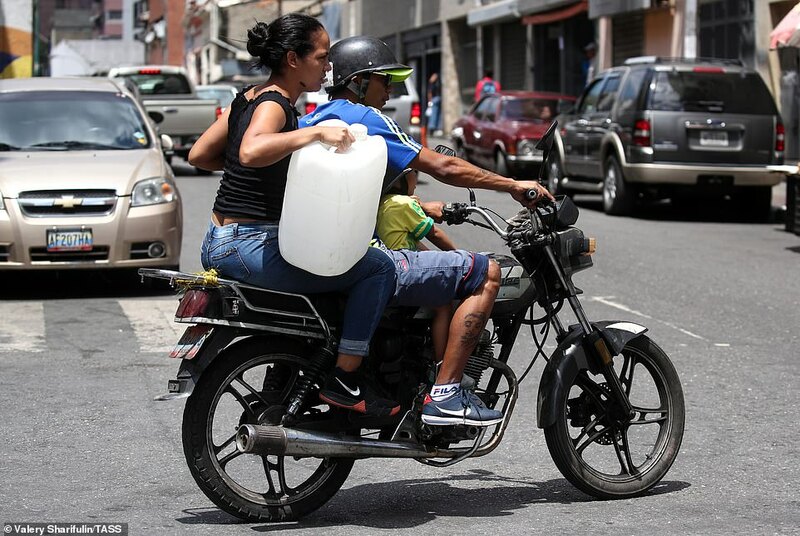 ‘My son and my brother live outside Venezuela, and they want to hear from us,’ said Bernadette Ramirez, who came with some neighbours to the highway. 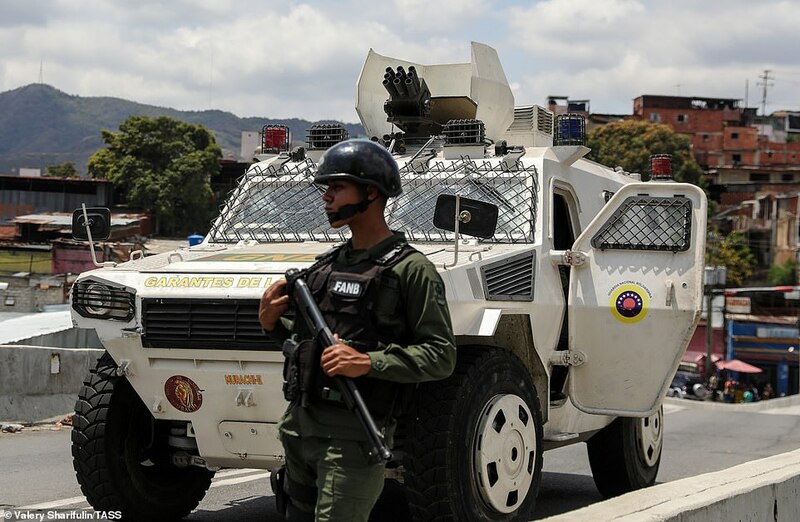 US President Donald Trump’s national security advisor said Sunday that members of Venezuela’s military have been in conversation with National Assembly members about how they might move to support the opposition. 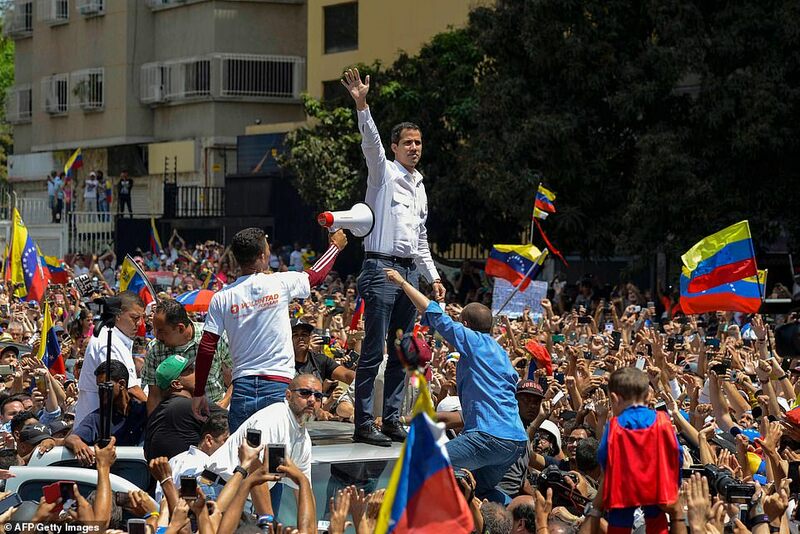 National Security Advisor John Bolton stopped short of predicting the ouster of President Nicolas Maduro but said momentum is on the side of Juan Guaido, the National Assembly leader who proclaimed himself acting president. 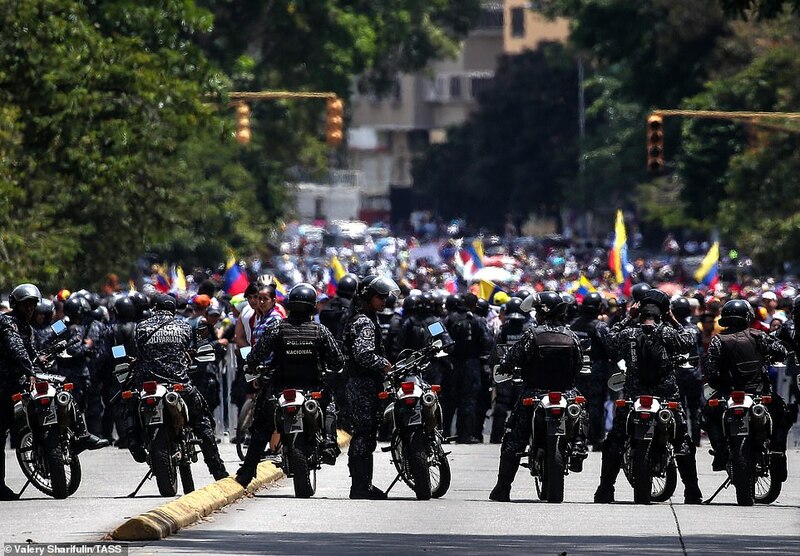 ‘There are countless conversations going on between members of the National Assembly and members of the military in Venezuela, talking about what might come, how they might move to support the opposition,’ Bolton said in an interview on ABC’s This Week. 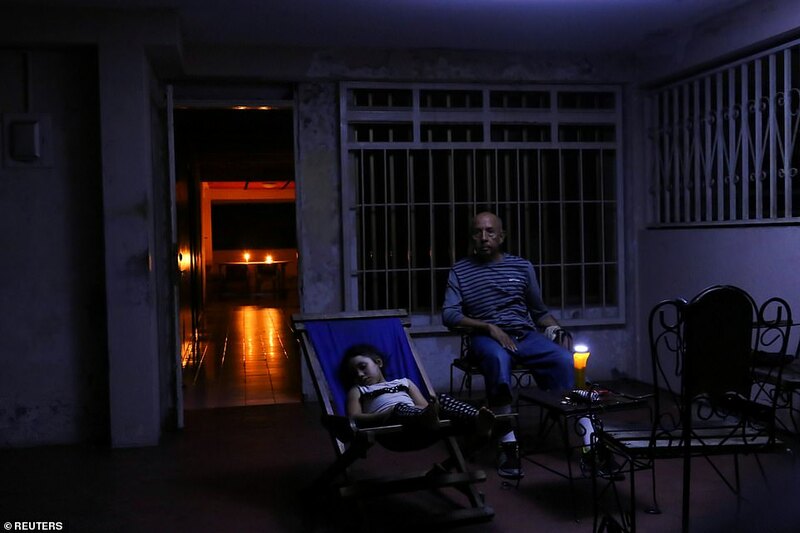 Many parts of Venezuela remained without power and communications on Sunday after several days of the country’s worst blackouts, which forced some hospitals to treat patients without electricity and compounded an economic and political crisis.